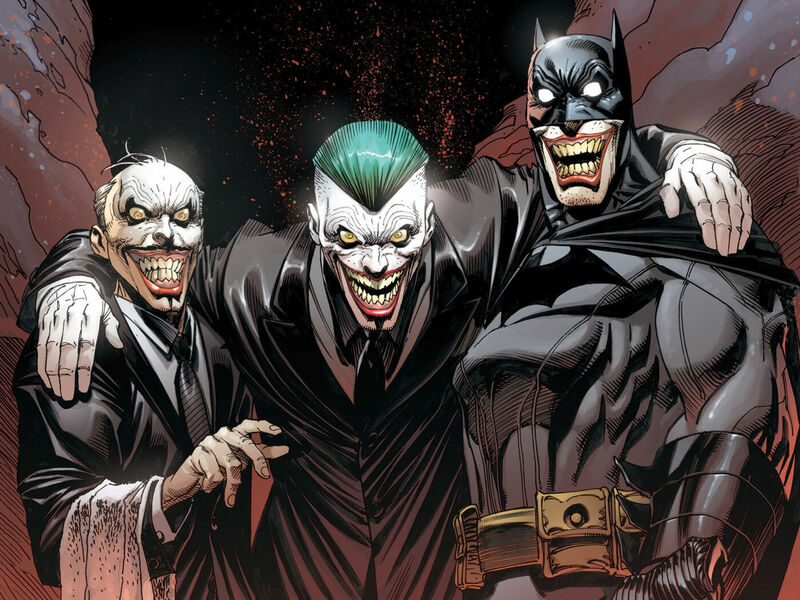 The Joker is back with new gags for his old pal Batman by twisting the Justice League and people of Gotham into laughing maniacs. While still dealing with an exposure to Fear Toxin from Scarecrow recently in form of vivid nightmares, Bruce Wayne is slowly catching up to his loyal butler Alfred Pennyworth and his daughter Julia Pennyworth in one of his many Bat-bases. Being impressed at her, he asks Julia whether she would consider being his butler from now on. When they were catching up, Wonder Woman suddenly comes crushing out of nowhere, pushing Bruce against the wall and then taking him through the city to the Robinson Park while stating her and the Justice League's intent to finally kill him. It immediately led him to instruct Alfred for proceeding with one of his contingency plan "Fenrir". A cloud of gas is released throughout Gotham covering almost ten square blocks and people were panicked for an evacuation. Upon clearing the area, Bruce gets into a brawl with Diana in his Justice Buster suit and pummeling her hard as she does not hold back. She is taken down by a relic and before he catches a break, it quickly turned into a street fight with the arrival of Aquaman and The Flash. He was prepared for Cyborg or Green Lantern to show up after defeating this two but the worst has yet to come. He was hoping for Superman not to show up but the Man of Steel made his grand entry eventually. From Gotham Royal Theater, this super-human brawl of destruction between Batman and Superman broke in and got out of hands very soon. His extended grin followed by a maniacal laugh revealed that it has all been orchestrated by his eternal nemesis The Joker, who's behind all these current mess and has returned once again to torment him. In spite of his efforts, Big-Blue couldn't shake it off and The Dark Knight goes all in before finishing it off with a Kryptonite gum hidden in his suit's helmet just to restrain his overpowered opponent. Batman barely got out alive from at the end of the fight with a rogue Superman using numerous feats at his disposal but left devastated in the end. After taking care of his friends in Justice League, he goes back to Batcave suggesting Alfred and Julia to go into hiding but they both decided to stay and help him. Looking for clues, Bruce visits the ruins of Arkham Asylum and enters the cell where Joker was kept before he came across Eric Border, who starts catching up of the old times. He traps Batman into the cell and slowly starts revealing himself to be the Clown Prince of Crime, who's been hiding in plain sight all along. Locking him up there Joker released an airborne "Joker Toxin" to infect the whole city with his insanity. He assures the Caped Crusader in his paralysis from the gas that he won't stop at nothing this time. 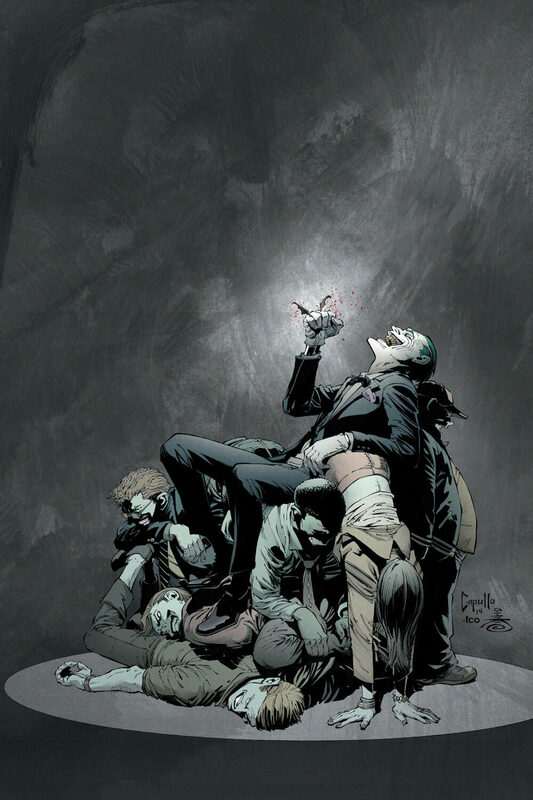 Barely make it back to Batcave, it took all of his mental strength and will to shake off the effects of the toxn only to learn a city-wide spread of madness by the gas and Alfred was unable to come up with an antidote even after running several antitoxin simulations but the virus remain resistant as Joker is using something unique this time. So, looking for patient zero of this pandemic to find a solution, Batman quickly heads to Gotham Presbyterian Hospital where the first infected patient is kept and informs Jim Gordon on his way about it asking if he knows anything about it but Jim was actually hoping to get help controlling the madness that has consumed the city this evening. As The Dark Knight gets busy with infected horde, Gordon starts going through old record photos for history of tragedies it had in past, where he finds Joker's face in the background in many photograph of tragic incidents. When he gets knocked out by boxing glove on a spring, Jim realizes in horror that the maniac is in same room with him. The clown then proceeds to attack Jim Gordon at his home but gets shot at heart only to come back shortly afterwards when Gordon was making a call and stabbed him with an axe before addressing Bruce on phone by his name. Then he intrudes the Batcave and had an encounter with Alfred that would surely leave a mark on one of them. Back at the hospital, Batman finds out his parents' killer Joe Chill is the patient zero to his surprise and he finds himself in a mock-up situation of that night in Crime Alley, where a boy named Duke Thomas takes his place. He managed to save them by taking a bullet but his parents get infected when and he then runs with Duke. Batgirl, Bluebird, Red Hood and Red Robin as well as super-villains like Bane, Clayface, Killer Croc, Penguin, Poison Ivy, Mister Freeze and Scarecrow comes forward to make a last stand for Gotham against an entire city turned crazy. Meanwhile, The Dark Knight goes to seek out and face the Clown for one last time to settle all scores once and for all. For more information on Batman – Endgame, you can check out the link below. 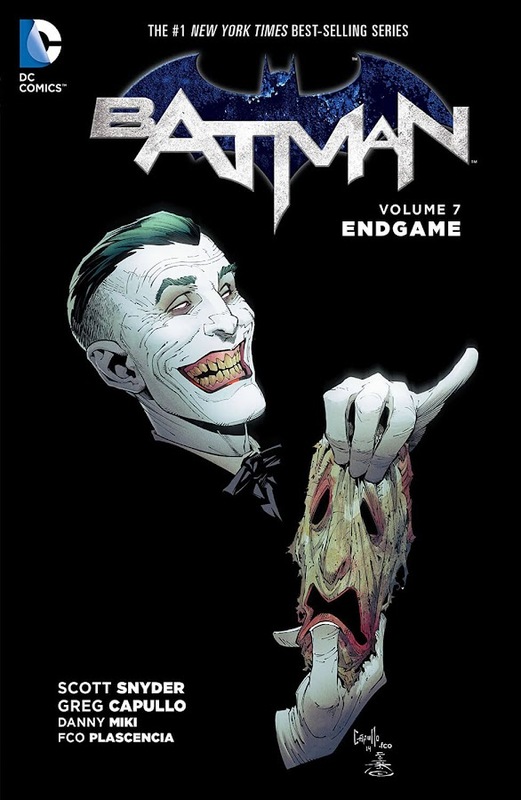 Here is your links to buy "Batman – Endgame" from DC Comics in issues on Amazon. Here is your links to buy "Batman – Endgame" from DC Comics on Amazon. Since the beginning of The New 52 from DC Comics, the duo of writer Scott Snyder (American Vampire, Superman Unchained) and artist Greg Capullo (Haunt, Spawn) has been proving themselves as one of the finest collaborators in the comic-book industry. They are one of the best creative team for a Batman monthly ongoing series ever. Following the massive build-up of The Dark Knight’s Prime Earth mythology, Batman’s greatest enemy, The Joker is back for business and not fooling around anymore. Derived of the second publication of Batman ongoing monthly series from issue #35-40, "Endgame" storyline also contains some tie-in issues to be added for sake of reading. Major stories throughout the course of the series like Court of the Owls, Death of the Family and Zero Year are also hinted in certain points of the plot and many fan-favorite heroes and villains made their appearance in this tale! The part Nightwing plays in Batman's plan against the maniac was a twist that no one ever really expected at all. Showing up in all the old press photo background to indicate he has been out there for a while and probably even an immortal individual, The Joker really played a dark prank on many good-guys. Following this arc, the maniacal clown does not return until the ushering of "DC Rebirth" and his origin got revised a bit for a fresh-start.